"Journey of thousand miles starts with a step".......The inspiration behind me. Today's challenge was to climb Salher and Salota. We woke up at 5.30am, took the bags from the aunty and reached to the main road where we could get the vehicle towards Waghambe, base village for both the forts. Usually frequency of vehicles towards Waghambe is less from Taharabad. 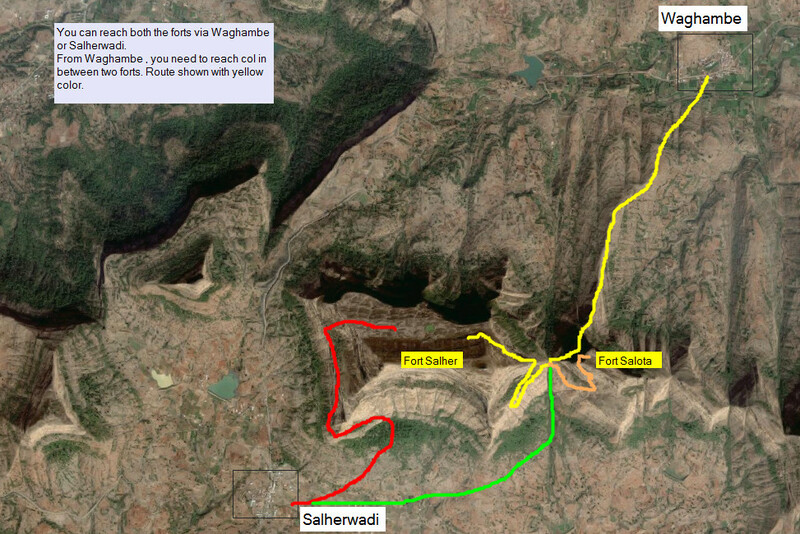 So we followed the route till Mulherwadi, base village for Mora, Mulher and Hargad fort. We had breakfast there and headed towards Waghambe by six seater. It took us 1 hr to reach the village. We kept our bags at a villagers house and confirmed the directions. From Waghambe, you can clearly spot the col in between Salher and Salota. To reach col, we climbed a hill with considerable ascend. Route till the col is well trodden. You can always confirm your orientation with the direction of col. It took us 1.5 hrs to reach the col. Right Fort is Salher and left one is Salota. Route to Salher is considerable traverse after col; followed by ascend using rock cut steps. Entire route is distinct. Not at all chances of missing the route!!! We passed through series of gates(still in good condition). After third gate, you again need to walk on a traverse. On this traverse you will find numerous caves some carved, some naturally build. Most of them may be used for storage of water. At the end of this traverse we again passed though a gate and entered into vast expanse of Salher. There are numerous remnants on the fort. Significant in them is Gangasagar lake, Renuka mata temple, cave in front of temple. Vising the highest place on the fort i.e. temple of Lord Parshuram was most amazing moment of our entire trek. View from the top was mesmerizing!!! Spending quality time in the temple, we moved to Salota. We descended down completely till the col and started walking towards Salota. Route to the Salota is not well trodden. So from Salher top we mapped the route( with guessing ) and searched the route accordingly. From col to certain distance route is distinct but at the ascent there are multiple routes emerged. You need to confirm your directions with respect to rock cut steps. Steps are visible from the route. We struggled 15-20 minutes to reach to correct path. Constructions of rockcut steps are awesome. All the forts from Nasik region has the peculiarity of having extraordinary stone work at the entrances, steps etc. It was 1.00pm , the peak heat time. Entrance to the fort is 70% buried by landslide. And looking at the condition of stones, there are lot of chances of such incidents again. Like Salher, Salota also has many caves, used for storage of water. Passing through 3 entrances we reached on the top of Salota. Area is small as compared to Salher. Few water tanks, broken temple and amazing views ; that are the only things present on the fort. After Sight-seeing and photoshoot we descended down till col and then to Waghambe. Overall these two forts are scenic in terms of the construction of the entrances, its routes and the surrounding area from the top. It was 4th day of our trek. Due to personal reason, i opted out of the trek for 5th day. Later Ganesh,Ruturaj didn't want to continue. The only willing member was Mahadeo. But due to lack of company he averted his plans to trek Mulher,Mora and Hargad. From Waghambe we grabbed a truck to reach Mulherwadi and from there to Taharabad. I headed towards my hometown Chalisgaon and other three had dinner at the aunties mess and moved to Pune. It was truly endurance testing range trek due to harsh heat. But the forts made us strong and confident to conquer one after another!!!!! Lot of trekking yet to come!!!! !